Directed by J. C. Chandor. 2014. Pity the popular director. You might find your heart too hard to make room for Steven Spielberg, Christopher Nolan, and Martin Scorsese, but imagine the stifling layers of expectations that audiences heap upon their every movie, their every frame. No theme or symbol, sound or subtle comment is free a from dissecting comparison to their style. As you watch their latest piece you watch all of their movies and all great movies alongside. If you cannot pity the director, though, then pity the film-goer, bombarded by trailers, commercials, billboards, and award campaigns. There is liberty in anonymity for the director, and in ignorance for the audience. There is special excitement in the air, then, when you fold down your squeaky seat, nestle your soda in your hand, and sitting down to see a movie about which you know nothing, you wait for the language of film to unfold the story. It is a happy coincidence that every time I enter a movie in such blissful naiveté, I am not disappointed. A Most Violent Year had me at its opening shot in which a man makes his afternoon run, stops, and turns around. Now even with the director unaware of me and I of him, we both know this gesture. Simple and clear, it is the whole story: Abel Morales is striving. For another movie this meaning would be the end of the shot's significance, a prefiguring of the plot, yet for A Most Violent Year this shot never dies. We know for what and with what and for whom and especially how–the how is the essence of the plot–but continually ask why Abel strives. It might seem an obtuse and overly subtle question because we observe an obvious story in which Abel struggles to grow his oil delivery business against the depredations of a corrupt city at the low ebb of its greatness, New York in 1981, but the why of a movie is its essence. 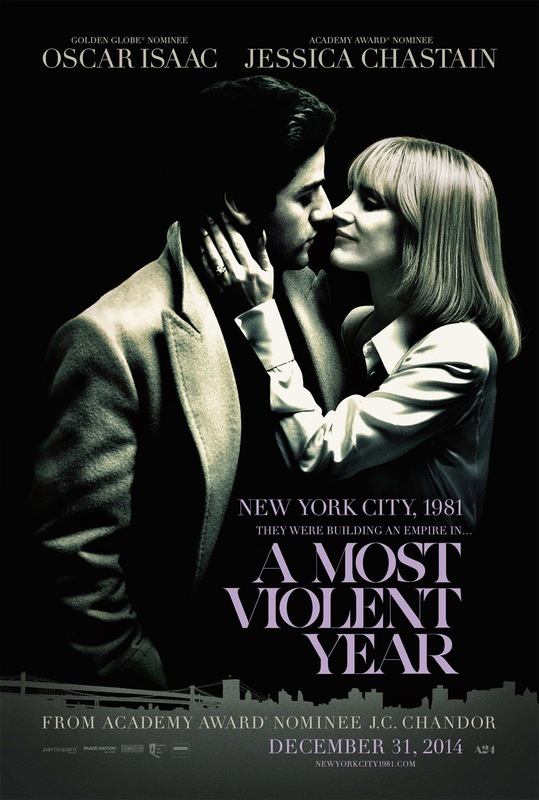 At one level of course A Most Violent Year is about Abel fending off predators from his fledgling company. Constantly at odds with him are the district attorney, who hopes to sue him for hiding funds, a cartel of competitors who are squeezing his territory, an unknown rival who is hijacking his trucks and assaulting the drivers, and finally the union boss who threatens a strike if he won't let his drivers carry guns. Yet as much as Able fights to preserve his business, he does so within a code of conduct, steadfastly refusing to breach his ethics even to preserve his lifelong enterprise and dream. He complies with the DA's investigation. He cooperates with his competitors. He seeks the police to protect his trucks. He refuses to arm his drivers with unlicensed weapons. Yet again and again at every turn Abel is stymied and subverted. No one cooperates and no one helps. Scene after scene we see Abel pushed closer and closer into a corner until he has two days to pay of a massive loan and rescue his business. The tension driving the whole movie is the mounting burden on Abel wherein we wait for him to breach his code. Amplifying these external pressures is the strain from his demanding wife Anna (Jessica Chastain), who as the daughter of a mob boss encourages Abel to break a few skulls instead of remaining within the boundaries of the permissible. Much as we sympathize with Abel, we do grow with Anna to wonder whether he will ever prevail, if the nice guy can triumph. One evening Abel and Anna riding in their car strike a deer. Abel steps out and finding the animal writhing in pain grabs a pipe with which he will put it out of its misery. He stands there unable to commit until we hear gunshots and slowly realize that it is Anna who has remorselessly put the animal down. The sense is clear, that Abel is too weak, but the sense presents a false dichotomy: being unable to put down an animal and being unwilling to murder people and break the law are not parallel choices. When the couple returns home Abel forcefully but with great restraint chastises Anna for jeopardizing the family by carrying an unlicensed firearm. Her response that Abel is simply a wuss exposes her contradiction which we briefly shared. Indeed Anna is herself a contradiction. She is at once supportive of Abel and then scourging him for his moderation. She desires the things which money and security buy, but is willing to risk their loss by flying off the handle. We see her both ruthless and nurturing, aggressive and patient. From her we see glimpses of both Lady Macbeth and Odysseus' Penelope. She ever lacks, though, any self-knowledge. Anna never comes to any greater realization, but merely waxes back and forth between extremes as her husband negotiates the family and business through the treacherous narrows. The journey comes to a climax when Abel chases down one of the hijackers of his trucks and, interrogating the man, has the opportunity to kill him. Up until now Abel has been on the defense, a weak pawn progressing against prevailing and manipulative forces swirling around him. Before he had no power besides his resolve and virtue. Now he finds himself with the power of violence but also the potential to lose his moral authority. At length Abel relents and frees the frightened man who leaves him with a breadcrumb he can follow back to the culprit. Not only is Abel rewarded for abstaining from vengeance, but we see another contradiction: the violence would not have helped his cause. Moreover it would have damned it, as it would have before. Parallel to Abel's success, though, is the path of one of his drivers, a young man named Julian, who after getting beat up in one of the hijackings is shaken to his core. Julian is afraid to go back out without a gun, but Abel responds with a moving heart-to-heart, part pep talk and part credo of courage and perseverance. Still fearful, though, Julian packs a gun and ,after pulling it in another attempted hijacking, must go on the lam from police. In the final scene, amid Abel's achievement overlooking his vast new storage complex and the New York skyline, Julian shows up, hysterical with fear and anger. He cannot understand how Abel succeeded where he failed. In another speech Able helps him see that it was his own weakness which failed him. Like Abel, he could have chosen another path, but unlike Abel, he gave into his fear. Here in fact the contrast between the men is most evident, for now when faced with the opportunity to lie and betray his virtue by flattering Julian to save his own life, Able remains firm and honest. Is worth noting here that Abel is the most oratorical character I have seen in a while, eloquently arguing his case before thugs, union bosses, attorneys, his wife, and his employees. In each case he presents both firmness and moderation, arguing from principles with such steadiness that he disarms all of his opponents, who fly off the handle and double deal behind his back, but never disagree or disrespect him to his face, save Anna. Surrounded by aggression and temptation, Julian remains level-headed, never betraying his calm or cause with outbursts, even faced with ruin and death. Yet while Julian's fate ends in tragedy and Abel's competitor's ends in humiliation and defeat, Abel's moderation leads him to triumph, right? Since we rebuked Anna for lacking self-knowledge, though, perhaps we should ask the same of Abel. Certainly he understands that he wants success, but why? When his advisor Andrew (Albert Brooks) asks him why he is doing all of this, Abel responds, "I don't even understand what you are talking about." This reply is nothing short of shocking: can Abel, ever articulate and full of principle, not explain the chief motive of his life? The answer could be to preserve honor, to provide for his family, to prove his virtue–all good motives–but how can he not know? The question of his motive and self knowledge becomes the central one when the DA tells Abel in the film's last line, "I hope it was worth it." This question turns the movie on its head: is Abel a hero or a fool? Is the finale his moment of triumph or a monument to his blind pursuit? Yes he succeeded, but we really should ask whether it was worth the suffering. If he suffered in pursuit of something foolish then it is no triumph, nor absent any recognition or self-knowledge is it proper tragedy. This is an ingeniously chaffing and stimulating if not fully satisfying conclusion in which we cannot fully get behind a moral man and his valiant pursuit because we know only its form and not its substance. So deep is Abel's commitment to success, though, that it is worth considering it in the light of ἀρετή, or excellence. Perhaps in Abel's world, excellence is a virtue and end in itself. He certainly seems to play by a different set of rules than everyone else, so good and steady is he that at times he looks a magnanimous giant among men, so perhaps it is fitting that neither we nor anyone can see his hidden virtue. Within only himself then is his ἀγών, struggle, not only explained but justified and praiseworthy. Still there seems no way to reconcile the fact, a detriment to the drama, that Abel never struggles with his belief. Yes he has many opportunities to change his mind, but save one we never for a moment think he is tempted to betray his principles. Nonetheless this is a gripping story. It is directed with a light touch that lets the acting and events move the story, and though that story does not stitch together to perfection, it is so rich that we can scarcely complain. Chandor's script has crafted a conundrum in the sinews of Abel Morales, the cause of whose unflinching and scrupulously moral pursuit is either a mystery or self-evident. We are left asking, quite uncomfortably: what good is the virtuous, even successful pursuit of the unexamined life?